Who will stop Jones Bootmaker from walking away from our high streets? News broke this week that one of the high street’s old timers - Jones Bootmaker is looking for a buyer as it struggles to deal with difficult trading conditions and increases in business rates. The brand, who have 96 stand-alone stores across the UK (excluding concessions) started out with one store in London in 1857, and have since expanded across the UK to have a presence from Truro up to Inverness and many places in between. There have been murmurs of interest from a couple of different buyers recently, but what does the Jones Bootmaker estate, as it is now, offer to potential investors? We can use LDC’s location insight platform to easily give us a view on the portfolio as well as risks and opportunities for a brand in this space. 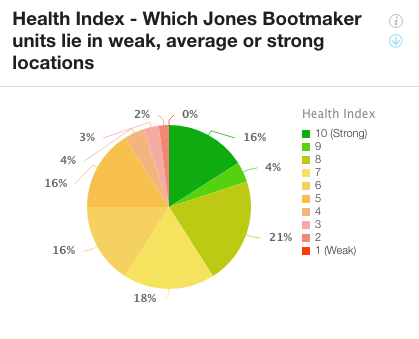 Analysis of the Health Index scores (developed by LDC in partnership with Morgan Stanley) for Jones Bootmaker locations shows not a wholly negative picture. 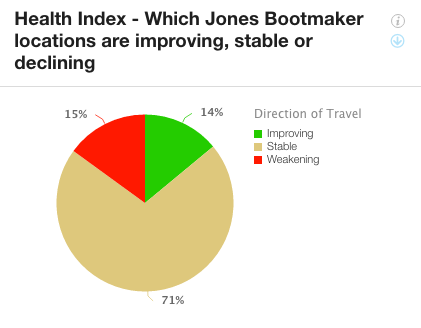 Whilst 15% of locations are weakening in terms of Health Index score, 14% are improving and the majority are very stable. This would suggest that Jones Bootmaker’s troubles are not because their stores are in areas that are performing badly. Digging further into the Health Index scores, we can see an even spread of colours on the pie chart above, with the majority of stores located in places with scores that range between 8 – 5, and 60% of stores in locations with a HI score of 7 or above: a pretty healthy picture overall. Jones Bootmaker stores on the whole are either on high streets or in shopping centres. What is also interesting is that vacancy rates for Jones Bootmaker's locations are significantly below the GB average, reinforcing the view that their stores are in healthy schemes and centres. However, with healthy locations invariably comes high rents, and increased competition. However, Jones Bootmaker’s estate is shrinking - they have lost 7 stores in the past 12 months across their estate and they didn’t open a single new store, creating a net loss of 7. The majority of stores closed were in Greater London and the South West, areas we could expect to carry higher rents. If we look at shoe shops as a whole, we can start to see that the Jones Bookmaker is not alone in suffering from stock loss. When we look at unit numbers across regions of GB in LDO, we see a sea of red bars– all suffering from losses in shoe shop numbers. 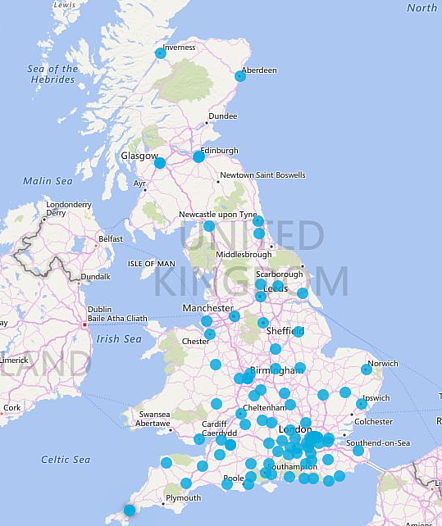 Looking at the change in numbers for different location types across GB reveals a similar and unsurprising picture. Once again, all are in decline, with high streets losing the most shops over the past 12 months (a net loss of 74 units). Looking to the market and to competition for spend in this category – you can see here that 35% of Jones Bootmaker stores have five or more competitors within a 1km radius. As customers loyalty is rare, and is difficult given the choice for consumers, knowing who the competition are and where they are is absolutely key. This is without taking into consideration the added pressures of competition from online retail. Whilst many shoe retailers sell online, (Jones Bootmaker included) this approach will work for some and not for others, depending on your target demographic. Millennials are more comfortable ordering clothing and shoes online, trying them on and returning them via post or collection if they’re not happy. The increase of this type of shopping is reducing the need for a physical presence for some brands. Retailers like ASOS have no physical stores whatsoever, but continue to sell shoes alongside other clothing and accessory products. However, Jones Bootmaker’s target market is not millennials, but a slightly older, more cautious and more discerning consumer, with more money to spend on high quality products. Jones Bootmaker pride themselves on their ‘in-store customer service’, so with this focus and their current stores being in good locations, we’re looking forward to seeing who (if anyone) might come to the rescue of this brand and continue the turnaround that Jones Bootmaker have worked so hard to initiate.